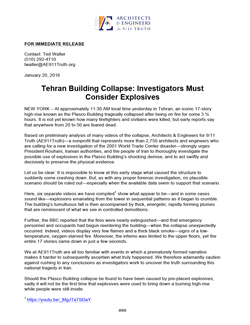 Earlier today, AE911Truth released a statement in response to yesterday’s tragic collapse of the iconic Plasco Building in Tehran, Iran, which reportedly claimed dozens of lives. The 17-story high-rise had large fires that burned for some 3 ½ hours before it suddenly came crashing to the ground. After carefully analyzing videos that were available online and reviewing the circumstances surrounding the shocking demise of this building, we determined that it was our responsibility to call for the possible use of explosives to be thoroughly investigated. Issuing this press release across the U.S., the U.K., and the Middle East — including in Iran — is costing AE911Truth $1,850. We encourage you to chip in toward covering this unanticipated expense, if you are so inclined. Thank you as always for your support. NEW YORK – At approximately 11:30 AM local time yesterday in Tehran, an iconic 17-story high-rise known as the Plasco Building tragically collapsed after being on fire for some 3 ½ hours. It is not yet known how many firefighters and civilians were killed, but early reports say that anywhere from 20 to 50 are feared dead. Based on preliminary analysis of many videos of the collapse, Architects & Engineers for 9/11 Truth (AE911Truth)—a nonprofit that represents more than 2,750 architects and engineers who are calling for a new investigation of the 2001 World Trade Center disaster—strongly urges President Rouhani, Iranian authorities, and the people of Iran to thoroughly investigate the possible use of explosives in the Plasco Building’s shocking demise, and to act swiftly and decisively to preserve the physical evidence. Let us be clear: It is impossible to know at this early stage what caused the structure to suddenly come crashing down. But, as with any proper forensic investigation, no plausible scenario should be ruled out—especially when the available data seem to support that scenario. Here, six separate videos we have compiled show what appear to be—and in some cases sound like—explosions emanating from the tower in sequential patterns as it began to crumble. The building’s tumultuous fall is then accompanied by thick, energetic, rapidly forming plumes that are reminiscent of what we see in controlled demolitions. Further, the BBC reported that the fires were nearly extinguished—and that emergency personnel and occupants had begun reentering the building—when the collapse unexpectedly occurred. Indeed, videos display very few flames and a thick black smoke—signs of a low-temperature, oxygen-starved fire. Moreover, the inferno was limited to the upper floors, yet the entire 17 stories came down in just a few seconds. We at AE911Truth are all too familiar with events in which a prematurely formed narrative makes it harder to subsequently ascertain what truly happened. We therefore adamantly caution against rushing to any conclusions as investigators work to uncover the truth surrounding this national tragedy in Iran. Should the Plasco Building collapse be found to have been caused by pre-placed explosives, sadly it will not be the first time that explosives were used to bring down a burning high-rise while people were still inside.